The ceremony reflects the innate bond between Andean peoples and the land. When held for Pachamama, they are also called payments to the earth or pagos a la tierra. Pagos a la tierra have traditionally been done as a way of asking permission to till the earth and of giving thanks for the harvest. 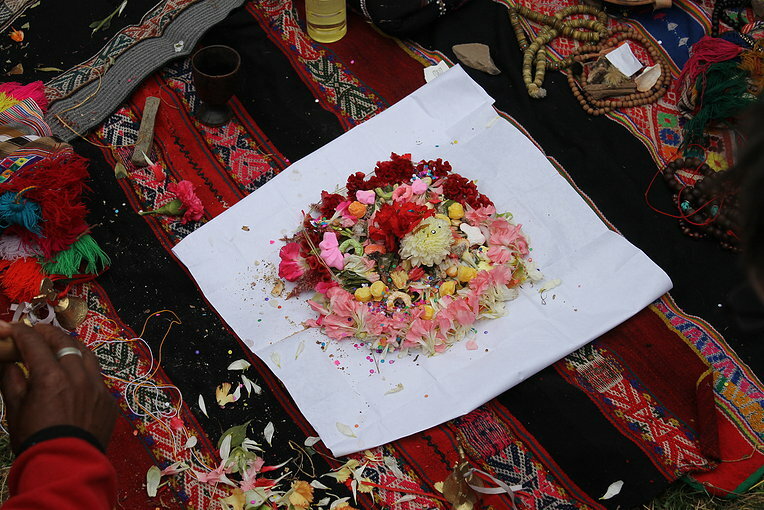 Offerings to the Apus are made to ask for and gives thanks for protection and for fertilizing the earth. It’s a recognition of the order of things and a way of making reciprocity for the gifts that are received. Traditionally, the rituals are performed by Andean priests who are called paqos or altomisayoqs. There are many different steps involved in performing a despacho properly. The details begin right from the setting out of the ceremonial blanket on which the offerings will be placed. These are weavings that represent the male and female energy. White paper is placed on top of the blanket or weaving and the offerings are placed on top of the paper. Incense is placed down first so that it will carry the prayers skyward. Petals of flowers are used, white for the Apus and red for Pachamama. These will be set down in a pattern, depending on the purpose of the ceremony. There will also be two colors of drink used as well, usually a red wine and white pisco. Coca leaves will be arranged in kintus, which are three leaves grouped together with the bottoms connected and the tops fanned out. These can be selected by the priest as well as by those people who are participating in the ritual. The kintus are blown on with the intention of the prayers. Other items will be added, depending on the purpose of the despacho. Things such as seeds, fruits and grains can be added to represent what is received from the earth. Sugar or candy is also often included for the sweetness of life. Shells, confetti, miniature figures, beads, llama fat (to represent the sun) and more may all find a place in the offering. Each item that is placed there has a significance and is put there with a specific intention. Once the offering has been completed, it will be bundled up and either buried or burned. There are many different types of despacho ceremonies for various purposes. All serve as a way for man to connect to the spiritual world, to recognize the place that he holds within the universe, and to give thanks and appreciation for life. The best chance you have of witnessing a ceremony for yourself is during a visit to the mountains around Cusco.